This post was originally published in June of 2010. Given the "rolling" format of blogs, I thought that I would repost it for newer readers. I was nicely surprised by Superhero: 2044, and will be blogging about Supergame soon as well as I own both the first and second editions of that superhero game. After reading this review, Donald Saxman was kind enough to include the test of the post in a reprint of the game. According to Heroic Worlds by Lawrence Schick and Steve Perrin in Different Worlds #23, Superhero 2044 by Donald Saxman is the first commercially available superhero themed role playing game. Saxman's game was publishedin 1977 under the name Superhero '44. The game wasn't entitled Superhero 2044 until the game's second edition, when it was by Lou Zocchi's Gamescience Inc. later that same year. While I am a huge fan of super hero role playing games, and a student of the history of rpgs, this game sat on my bookshelf for years without a complete reading. Its lack of a list of itemized superpowers, and the mechanics of how they worked, was one of the key reasons that the game languished for so long on my shelf without a thorough examination. Apparently, Donald Saxman intentionally left a formal list of superpowers out of the book in order to respect the copyrights of various comic book publishers -- though that didn't stop artist Mike Cagle from providing a cover illustration filled with characters who bear an uncanny similarity to many popular comic book characters. 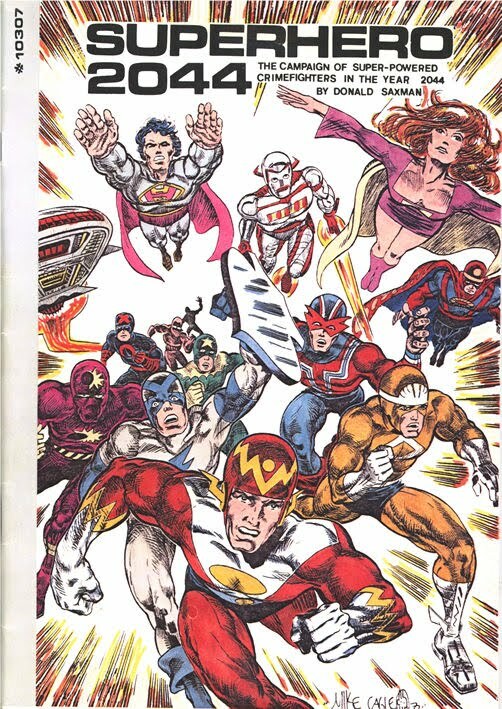 I just couldn't ever muster the desire to read or play a superhero role playing game that lacked a robust super power system. The recent release of Icons by Adamant Entertainment got my mind focused reading a new super hero rpg, and this opened the door for Superhero 2044 to work its way off the book shelf and into my reading pile. I quickly devoured the booklet and have come to the following conclusions. First, Superhero 2044 is almost unplayable with its Rules as Written (RAW). The game is a jumble of multiple systems and contains no fewer than three major design directions, none of which are flowing in the same direction. Second, without Superhero 2044 modern super hero role playing would not be what it is today. Those three major directions I mentioned above? Each of those had a significant influence on the super hero games that came after Superhero 2044. Without this game, there would be no Champions, Supergame, or Golden Heroes. Each of those super hero games lifts a concept out of Superhero 2044 and structures a game around that concept. Superhero 2044 is more than the first super hero role playing game, it is the foundation upon which many games followed. It was the first superhero game to include point based character construction. Though the point expenditure was limited to the building of a character's "attributes" and were not a part of "power design." This innovation, and at the time of Superhero 2044 this was a significant innovation, is one of the major design starting points for a number of super hero role playing games -- not the least of which is the Champions game. Speaking of Champions, in addition to being inspired by the point based character design of Superhero 2044 it is evident that Champions melee combat system was influenced by Donald Saxman's game as well. In Champions combat is resolved by taking a character's "Offensive Combat Value" and subtracting an opponent's "Defensive Combat Value." The result of that subtraction is then added to 11 to find the number required to hit an opponent on a roll of 3 six-sided dice. Champions combat system is one of the best on the market and the fact that it uses a comparison of combatant's effectiveness, and a bell curve resolution system, are among its chief strengths. In Superhero 2044, you take a character's "Stamina" and subtract his opponents "Stamina." The difference between these two numbers is compared to the Universal Combat Matrix which gives you a number between 3 and 18 that the character must roll on 3 six-sided dice to determine if the character hit his opponent. It should be noted that this combat system is only used for "melee" combat in Superhero 2044, where it forms the foundation of Champions combat. The Champions version is more elegant, as the result of the initial comparison is the modifier to the 3d6 roll, but it is the same system. It is as if the designers of Champions playtested and refined the Superhero 2044 melee combat system. Champions combat has some significant differences overall to Superhero 2044, but one can see that one echoes the other. Like Champions, Supergame was influenced by Superhero 2044's point based character generation system. Given its own 1980 design date, and the fact that it was a part of "California Gaming Culture," might hint that Supergame itself also influenced Champions. One sees the underpinnings of Superhero 2044 is in the purchase of a character's starting attributes. Both systems feature something that many modern gamers might consider odd. All of a character's attributes start at zero and can be increased -- this itself isn't odd to the modern gamer. What is odd is that both games have attribute levels where the character is suffering from a disability. In Superhero 2044, if a character has an Endurance of less than 20 that character is "fatigued" or worse. In Supergame, a character with an "Agony Score" of less than 15 "may either move or attack, but only one per turn." There are similar penalties for "Vigor" in Superhero 2044 and "Physical Score" in Supergame. The names of the attributes and the level of effect are different, but one can see the similarities. Most modern systems would start a character with a base number of points sufficient to not be fatigued or incapacitated, but both Superhero 2044 and Supergame allow for the possibility. But it isn't the point based character design where Supergame bears the most similarity to its predecessor. Supergame includes rules for building specific powers -- though not as robust the later published Champions -- that are themselves an innovation over the state of gaming at that time and a step beyond what were offered in Superhero 2044. The area where Supergame most reflects Superhero 2044 is in its ranged combat system. In Superhero 2044, ranged combat is decided by rolling a six sided die and adding/subtracting to the die total applicable modifiers. This sets the target number that must be rolled, or higher, on a second roll of a six sided die. For example a character with a 20 Dexterity (-1) shooting an opponent at point blank range (-3) with a shoulder weapon (-1) rolls a 6 on a six sided die. This gives a modified result of 1 (6-1-3-1=1) and means that the character hits if the player rolls a 1 or better on the second roll. This system, with some differences in modifier values, is the system used in Supergame. "Each character fills out a weekly planning sheet indicating whether he is patrolling, resting, training, or researching. This...show[s] how many crimes of what type he's stopped this week and at what damage to himself; without actually having to play the event...Overall good fun and realistic and a welcome addition to any role playing fan's collection. Certainly as a postal game it has a great future." The weekly planning sheet is one of the most intriguing aspects of the Superhero 2044 game and the most playable aspect. The game includes weekly planning sheets that provide a number of "activity blocks" to which players assign particular tasks, like fighting crime or resting. 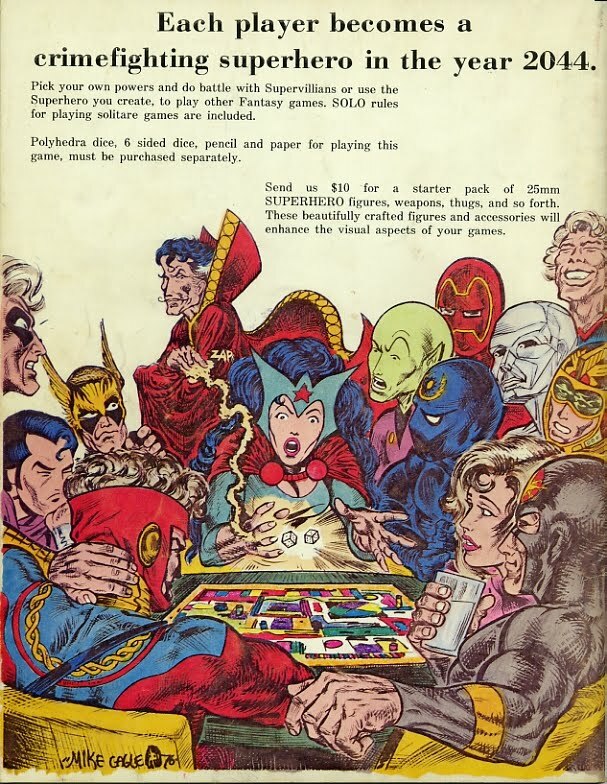 Golden Heroes, Games Workshop's super hero role playing game, featured a campaign system that bears no small similarities to that of Superhero 2044. Games Workshop was, and still is, the publisher of White Dwarf magazine and so it is easy to believe that this game review sparked some discussion of "planning sheet" style campaign play. The scenarios played in each week occupy a certain number of DUPs for the characters involved. Any remaining DUPs can be devoted to other pursuits such as training, improving powers, developing scientific gadgets, etc. Thus at the end of each scenario, you must inform the players how many spare DUPs their characters have. Preferably then, or at worst at the start of the next game session, the players must tell you how their characters have spent those DUPs. The player's allocation of DUPs is compared to various campaign ratings, something vary similar to what Superhero 2044 calls "handicaps," in order to determine what events happen to the character and how much the character is able to improve over time. Both systems are dynamic and change as characters interact with the game world. The Golden Heroes system is more developed and is a part of a more complete system of mechanics, but it is unarguably a descendant of the Superhero 2044 system. I wish I had read Superhero 2044 much sooner than I did. It is a definite diamond in the rough. While it would be difficult to play RAW, it has a large number of innovative mechanics and ideas. The fact that it contains enough ideas to influence no fewer than THREE super hero role playing games in their design is a significant achievement in and of itself. One cannot truly understand the development of the hobby without reading this game. I think I will try to play the game itself soon, though I don't know if I will try to design a comprehensive powers system or use an existing one to supplement the game, as the campaign play system still stands out as something that has some depth and would be useful in a number of games. Given the abstract nature of the campaign planning system, one could easily adapt it to another game for use. The game also features a detailed setting for super hero play. The setting lacks the microscopic detail of modern settings, but for the time the game was written it is quite intricate. Like the game itself, its setting is one that inspires addition and extension rather than provides a complete painting. Donald Saxman has created something pretty special here and I'd love to see someone take this system and make a modern edition out of it. It would take some work, but it would be worth it. Wow. Great post, Christian; Superhero 2044 and Supergame are among the few supers games I don't have from the early days (and I tried to collect them all). Makes me wish I had more time and a group with whom I could play some of these games with more frequently.. I'll be posting a photo of my copies of Supergame today in a post about my explorations which led me to find an FLGS in Southern California. We have some great ones. Interesting post! I always dismissed Superhero 2044 due to the lack of a powers list. Your post makes me wish I would have tracked it down at some point. Good to see that other people appreciate these rules. Started playing in my first campaign in 1978 - which ran for over 20 years ! The DM created rules for everything from Magic to Martial arts. One payer had his original character for 15 years - sadly campaign folded a few years back. That's right - some fascinating stuff, but unplayable as was.